Goa was the first place in India where we enjoyed total freedom to roam — no longer dependent on tuk-tuks, taxis, trains and flight schedules, we hopped on a rough-and-tumble scooter and headed off into the jungle. It was refreshing not to have to barter every time we felt restless; even though we’d had some wonderful drivers thus far. I had remarked to our driver in Delhi how incredible it was that seemingly few crashes occur on these wild streets. He raised his eyebrows — we just hadn’t seen any yet. According to him, more than 120,000 people lose their lives on India’s highways every year. And that’s just the reported number. It’s a different story in Goa. Panjim and Mapusa get a bit busy, and you’ll want a motorcycle capable of highway speeds to cruise the freeway, but other than that, you’ll discover the freedom to roam in relative safety. We were there over Christmas — peak season — and some roads in the far north and south were essentially deserted. It’s not to say that “any idiot” can scooter around Goa. Even in small towns like Chaudi (in the south) and in and around Calangute and Baga, things get tight. Keep your eyes wide open, scan all intersections, look three moves ahead and never stop honking that horn. Honk to slow down, honk to speed up; honk to turn, honk to go straight. Honk around corners, honk at intersections; honk for cows, honk for kids. Just honk. Don’t be timid — it’s India. Scooting from Morjim, a tour of northern Goa is a good introduction to the area’s motorcycling etiquette and safety. Head north past Mandrem and Arambol, the latter being a nice place to stop for lunch or tea, and carve through the jungle-rimmed streets to Querim and the ferry to Fort Tiracol. Watch out for trucks and busses — it’s best just to pull over when they come rambling up. Especially watch for trucks and busses coming in opposite directions at the same time. They edge by one another with centimetres to spare — or not. Plug your ears if you hate the sound of scraping metal-on-metal. Fort Tiracol is a lovely spot to sip a cold drink (non-alcoholic, you need your wits!) while enjoying expansive views of empty Querim Beach and the Terekhol River estuary. Keep a special lookout for dolphins. South again, past Morjim, you’ll scoot across the lengthy bridge into Siolim. Stop for ice cream, then scoot west to Vagator Beach, and Anjuna, then ride south past Calangute and Baga to check out Fort Aguada at the mouth of the Mandovi River. It’s a bit of a hike, so feel free to take in the view of this ruined Portuguese Fort from below. 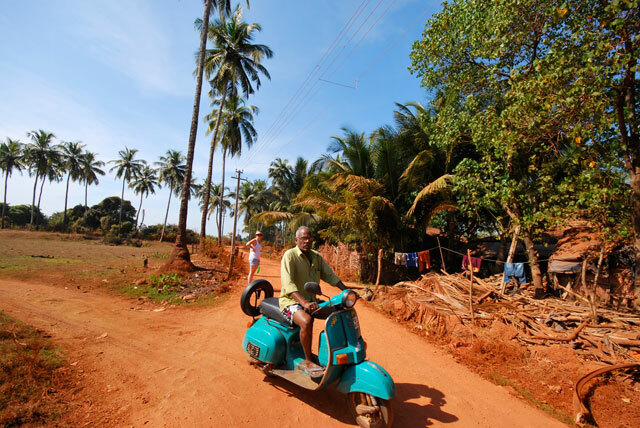 In the far south, near the golden-sand stretches of Palolem Beach, you’ll find similar scootering as in the north — perhaps even less crowded. Scooter rentals can be had for 300 Rupees per day (or less) at Palolem Beach, right at the main beach access. This is your best bet for finding an available bike — although often they’ll deliver them right to your hotel (for a tip). Palolem, as lovely as it is, is a tad busy during higher seasons, so we cruised to the lovelier (and far less crowded) Patnem, about three kilometres south. From there, a nice, 25-minute ride takes you to Agonda, a beach with a similar vibe to Patnem, though with a few fancy high-end accommodations offsetting the budget shacks. The road to Agonda is as empty as any road in coastal Goa will ever be. Enjoy the temperature changes as you dip from sunlight to shadow, as you rise in elevation and drop again, as you skim past rivers and down to the ocean. Ride the day away. It’s freedom, Goa style. Follow David Webb at his blog Across and Abroad dedicated to outdoor adventure and travel!